The outspoken Philippine president Rodrigo Duterte worries his Japanese hosts. Not just his policy toward the U.S. but also his informal style: Will he chew gum in front of the emperor? Duterte arrived in Tokyo on Tuesday for a three-day visit, his first since becoming Philippine leader at the end of June. For diplomats and political leaders, the main issue is his U.S. policy and how Japan can help mend those ties. Tokyo is a major U.S. ally, and has watched with concern as Duterte criticized the U.S. and said he would scale back his country's military engagement with America. He has also worried Japan and the United States by reaching out to China. 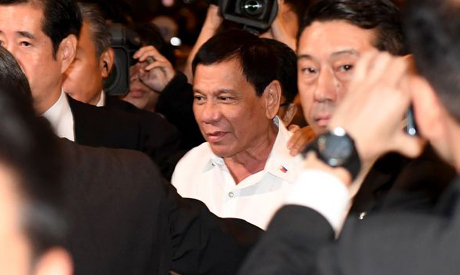 Japanese Foreign Minister Fumio Kishida told reporters he planned to ask Duterte what his real intentions are when the two have dinner Tuesday. He said Prime Minister Shinzo Abe will do the same on Wednesday. "I think it would be important that we ... directly hear opinions from President Duterte himself," Kishida said. The worries about Duterte were reinforced Tuesday when he lashed out again at the U.S. in a departure speech at the Manila airport. He called Americans "foolish," saying their land is stricken with "pure bigotry and discrimination," a day after senior American diplomat Daniel Russel criticized Duterte's controversial remarks and unclear intentions. "These Americans are really foolish," Duterte said, adding Americans travel to the Philippines "like somebody, without visas, these sillies." He also made a veiled threat to revoke a 2014 defense pact allowing large numbers of U.S. troops, warships and planes to enter the Philippines for combat drills. Referring to the pact, Duterte said, "Forget it," adding that in the future, "I do not want to see any military man of any other nation except the Philippine soldier." In Japan, a country where formality and politeness are highly valued, some are worried about Duterte's rough side, particularly when he meets Emperor Akihito on Friday. Japanese TV shows have repeatedly shown Duterte apparently chewing gum at meetings and other public occasions. In footage of a meeting with Chinese President Xi Jinping, Duterte walked in with his hands in his pockets and chewed gum during the handshake and a signing ceremony. "When he makes a courtesy visit to the emperor, his behavior could have a major impact," senior lawmaker Itsunori Onodera said Sunday on Fuji TV. "I trust he understands the consequences and would not do such a thing (as chewing gum). I do hope the Philippine side will remind him of that particular point." Duterte often doesn't button the top button of his shirt, wears jeans and has been seen without socks. In Japan, where the emperor was considered a living god until the end of World War II, people are expected to be extra polite to him and his family. "It's unbelievable. I have never seen anything like that!" former diplomat Kunihiko Miyake said on Fuji TV. "How could he dare to behave in ways that could cause his host to lose face." Japan is expected to offer Manila two large Coast Guard patrol boats — on top of an earlier pledge of 10 smaller ones — and TC-90 military training aircraft to help boost the Philippine's maritime security in the South China Sea.